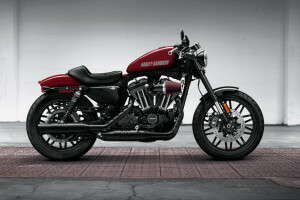 The RoadsterTM is the newest member of the Harley-Davidson® Sportster® lineup. The Harley-Davidson® RoadsterTM is a stripped down, powerful cruiser that delivers an aggressive yet comfortable riding position, a 1200cc V-Twin engine, and bold performance oriented style. If you’re looking for a bike that’s ready to let loose on the streets of Los Angeles and the Inland Empire, CA area, then the RoadsterTM is for you. 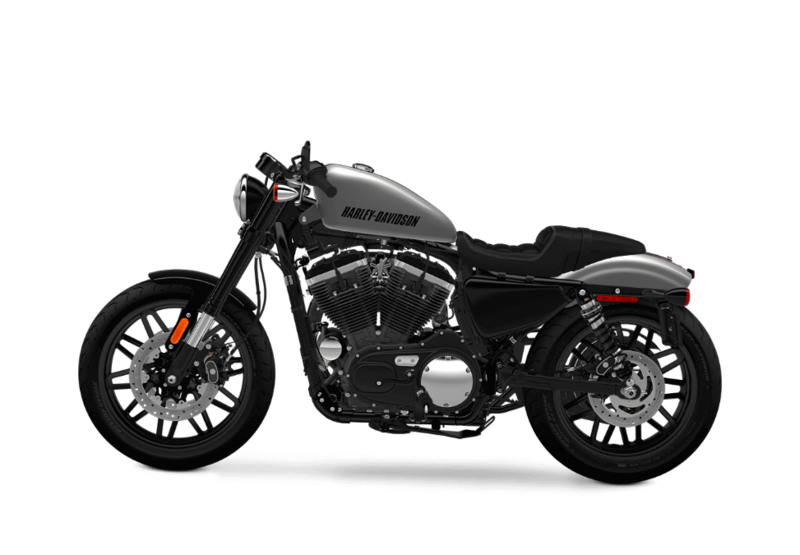 Find out more here at Riverside Harley-Davidson®. The RoadsterTM is an accessible, affordable, fun to ride bike that doesn’t skimp on performance and style. New 43mm Front Suspension with Inverted Forks: These oversized forks don’t just look great. They also provide added steering confidence, reduced unsprung mass, improved handling, and damping to smooth out the road. New Steering Geometry: The front steering geometry of the RoadsterTM is tuned to provide quick, agile handling, so you can easily navigate tight urban environments. 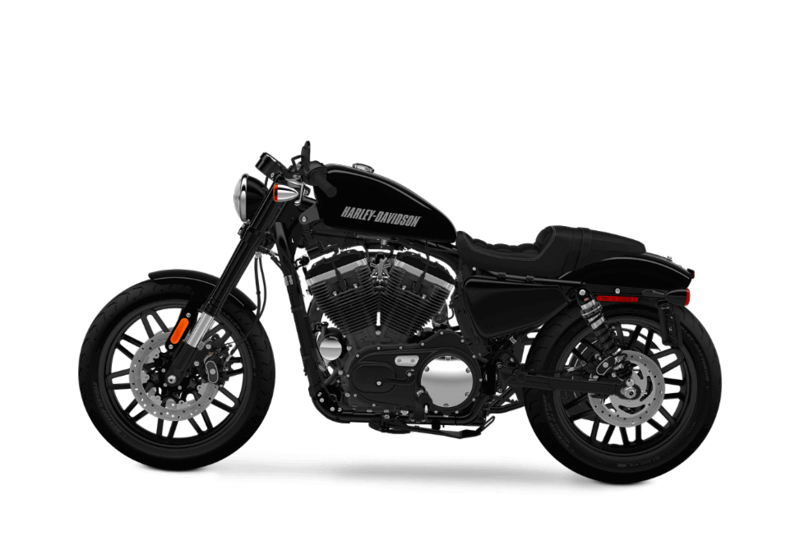 Dunlop® Harley-Davidson® Series Radial Black Wall Tires: These premium tires are designed to give you the best possible blend of performance, grip, and durability. The Roadster might be the newest bike in the Harley-Davidson® lineup, but that doesn’t mean it isn’t an authentic, classic Harley-Davidson®. Blacked-Out Styling: The RoadsterTM gets dark custom styling with blacked-out mirrors, belt guard, oval air cleaner, headlamp surround, and more for that unique, stylish, low-profile look. 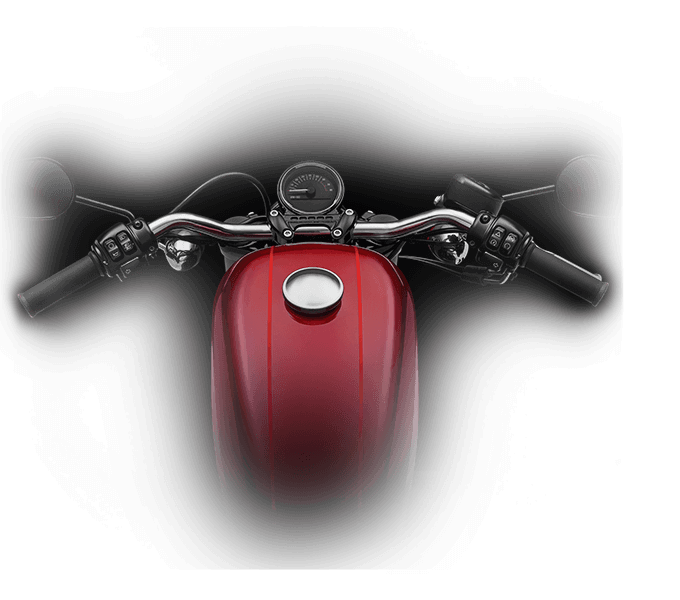 New Paint and Graphics: The high impact graphics on the fuel tank of the RoadsterTM make a bold impression and leave no one questioning where your motorcycle came from. 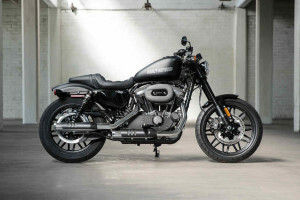 Slammed Handlebars: The slammed, drag-style handlebars put you in the perfect power cruising position, and the new, up-top speedo and tach gives you all the information you need right there on the bars. New Lightweight Offset Split Five Spoke Wheels: These alloy five spoke wheels deliver impressive performance and stability, and their low weight helps them spin up quicker so you can get up to speed. 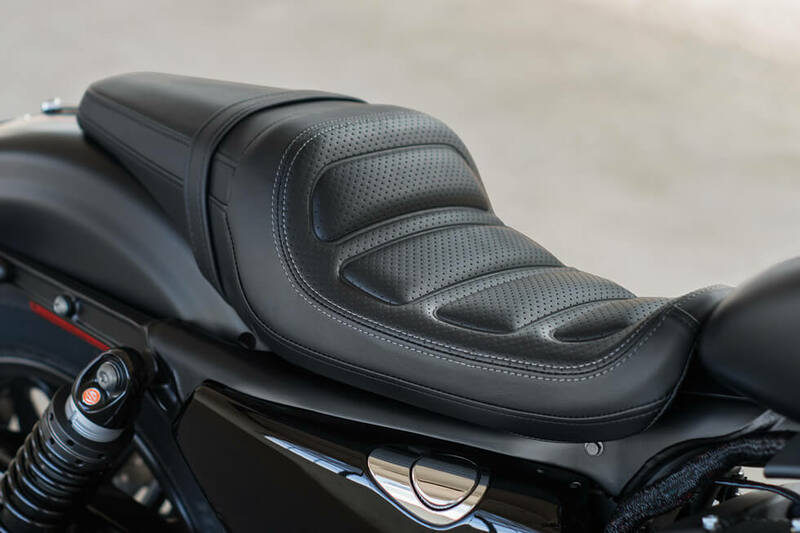 New Two-Up Seat and Rear Tail Section: The stylish, minimal look of the RoadsterTM carries on in the seat and rear tail section, offering a comfortable ride for you and your passenger. With a tight, chopped fender and side mounted license plate, you’ve got a sleek, stylish look. Chrome Exhaust Shields with Blacked-Out Muffler Shields: These distinctive pipes are visually stunning. Chrome exhaust shields and pipes are wrapped in the unique blacked-out muffler shields. 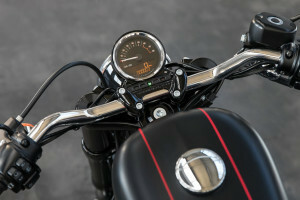 Air Box with Finned Timer Cover: The distinctive air box on the RoadsterTM, combined with a classic finned timer cover, provides vintage styling along with a unique 1200 badge. 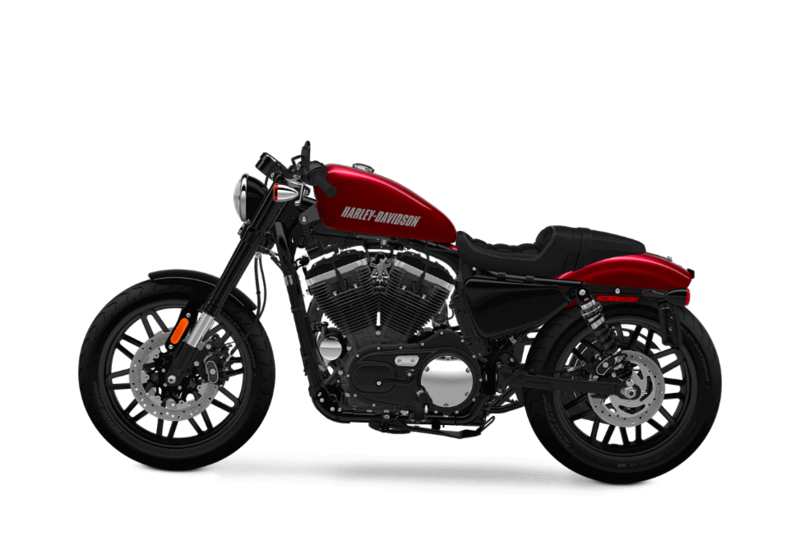 The RoadsterTM uses the reliable and powerful air-cooled 1,200cc Evolution V-Twin engine which delivers mountains of low end torque and high revving horsepower. 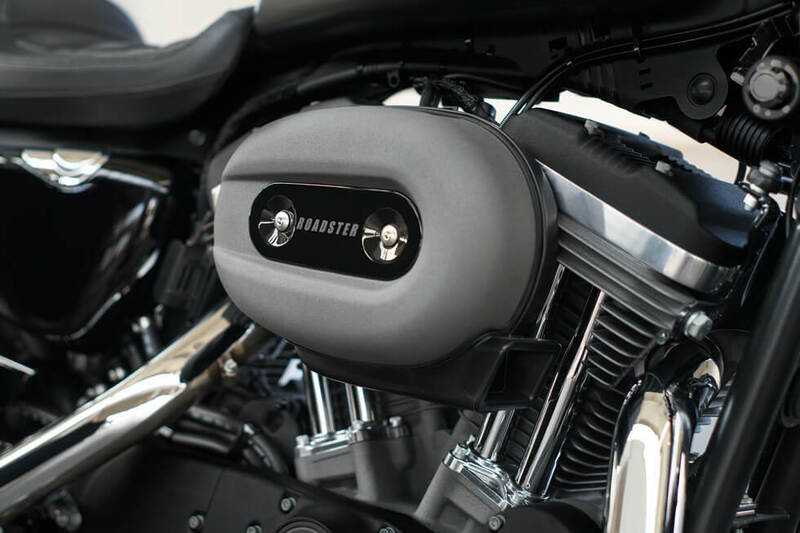 1200cc Air-Cooled Evolution® V-Twin Power: The Evolution® engine, otherwise known as the Blockhead, has been delivering the power that riders want since 1984. 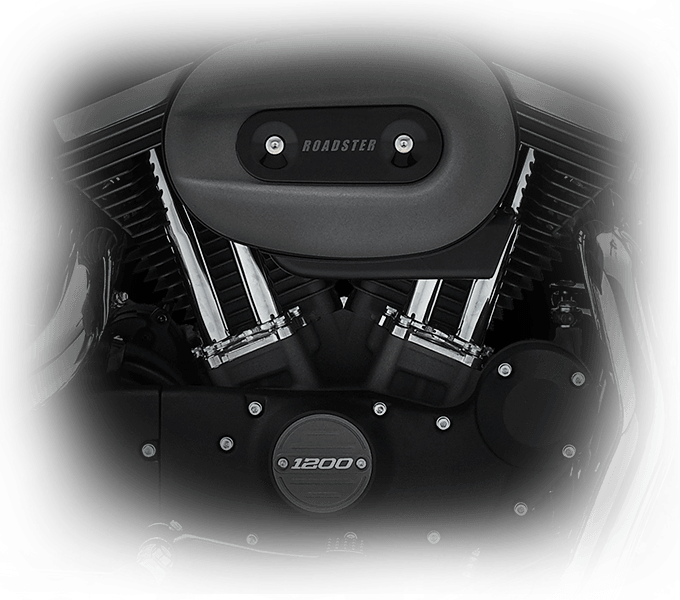 This durable power plant provides plenty of torque and horsepower to get you where you want to go. 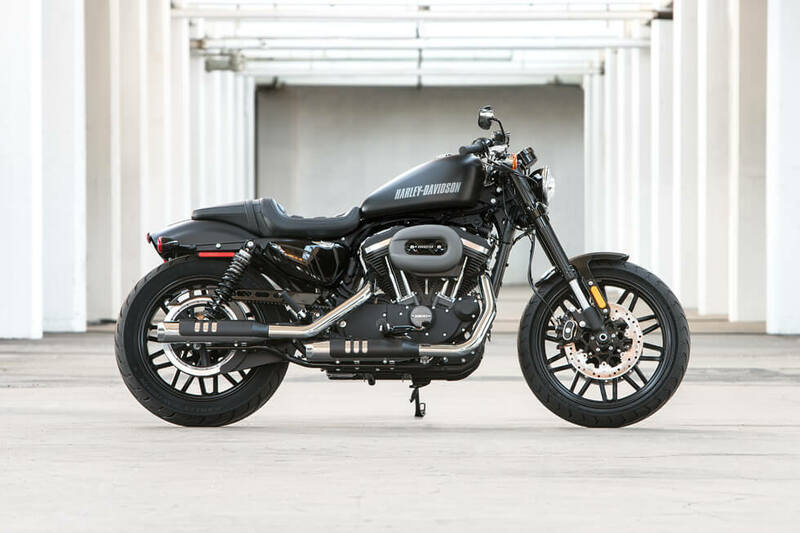 Iconic 1200cc Air-Cooled Evolution® Engine: Harley-Davidson® was built on reliability, power, and that iconic exhaust note. The Evolution® engine offers all three while still providing modern features like electronic fuel injection and lightweight aluminum heads. 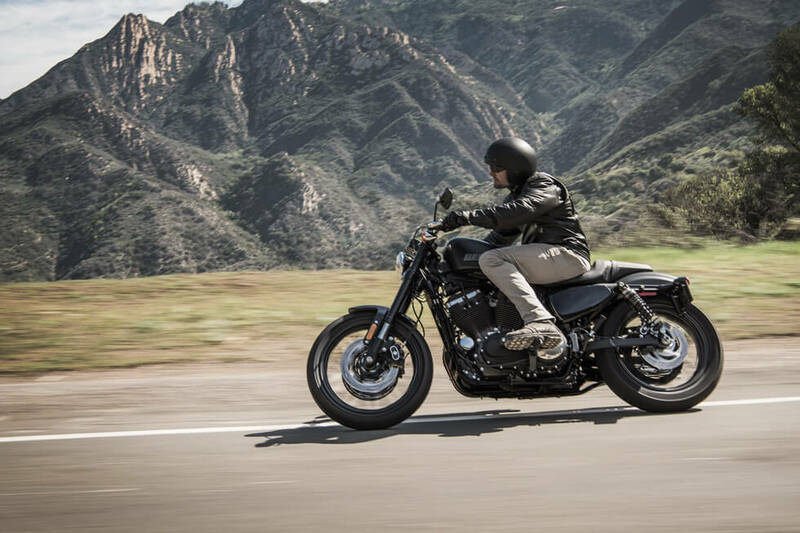 The RoadsterTM might be a stripped down street bike, but it also provides some high class comfort to keep you coming back for more. New Two-Up Seat: The two-up seat on the RoadsterTM is only 30.9 inches off the ground, so it’s easy to mount up, lift off the stand, or set a foot down at a light. Plus, the narrow seat helps relieve pressure and keep you and your passenger happy. 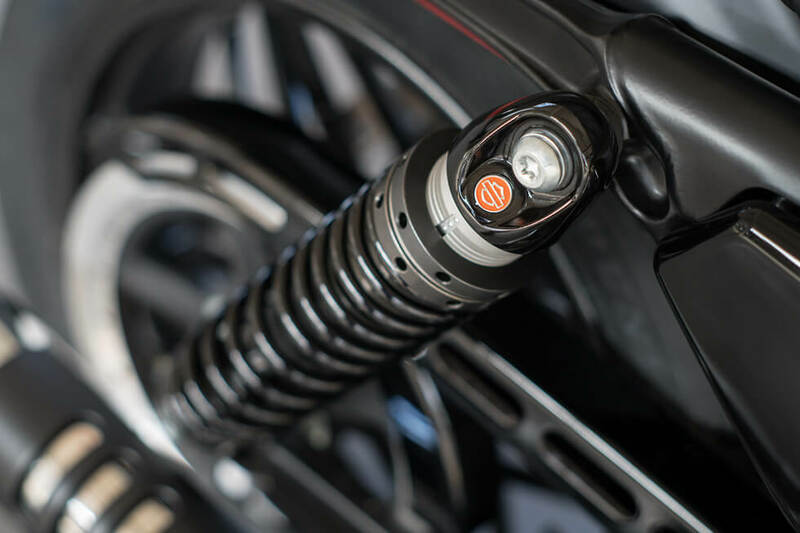 Premium Emulsion-Type Shocks with Pre-Load: It takes only a quick screw adjustment to set the adjustable pre-load on the rear emulsion shock, so you can always dial in the firmness you need for your ride. 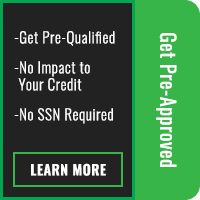 The RoadsterTM might be affordable, but it offers plenty of the latest technology. 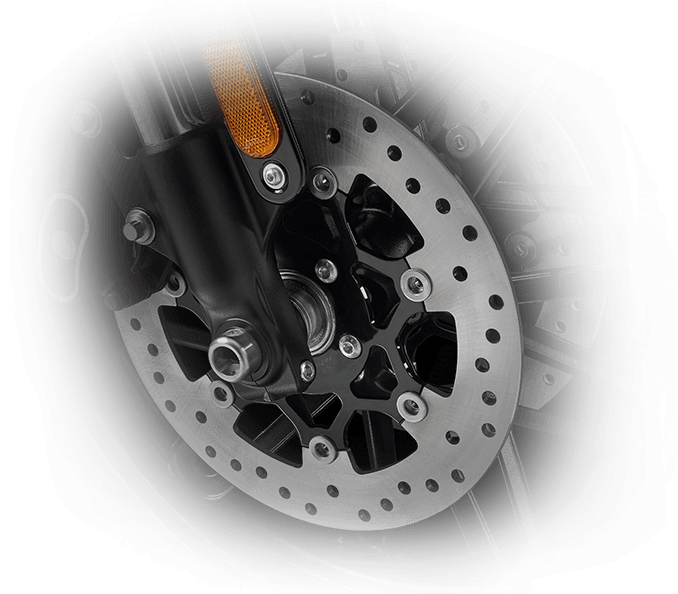 Dual Disc Front Brakes with Floating Rotors: The dual disc front brakes with floating rotors give you the stopping power you want, all while requiring less lever force to engage the brakes. H-DTM Smart Security System (Optional): With this smart security system installed, you can be confident that your bike is protected when you step away. The security system automatically activates when you leave the bike thanks to a wireless keyfob. Anti-Lock Brakes (Optional): It’s easy to slow down in a hurry when you choose to upgrade to the anti-lock brake system, as it virtually eliminates wheel lockup during hard braking.